Big news yesterday from Uwajimaya: Waji’s goes to Renton! After news of the potential move came out early last month, word came down yesterday from CEO Tomoko Moriguchi-Matsuno that the company’s fourth supermarket location (they’ve also got stores in Bellevue and Beaverton, Oregon) will make its debut this summer in the old Renton Village Thriftway — ETA: June. That’s great news for Renton shoppers (but maybe not so much for competing Asian supermarkets like the new Renton Viet-Wah and the longstanding 99 Ranch Market in Kent’s Great Wall Shopping Mall. Anybody who knows me knows how much I love trolling the aisles of Asian supermarkets and grocery stores to stock my cupboards, eat at their in-house kiosks and bring home the (uncured) bacon, dried fish and cheap produce. And I’ll explore the many reasons why once again on Friday when I celebrate that subject in a Ticket roundup. 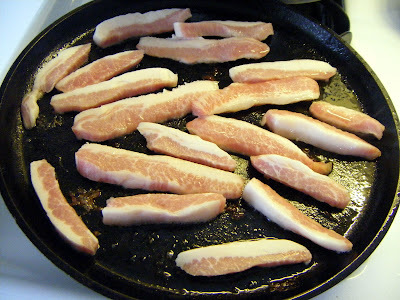 When life gives you pork jowls, make (Korean) lardons!